Indian accident investigators released their final report regarding the fatal accident involving the second NAL Saras prototype. The Indian designed light civilian transport aircraft, registered VT-XRM, was destroyed in a accident in March 2009 during a test flight. All three crew members were killed. 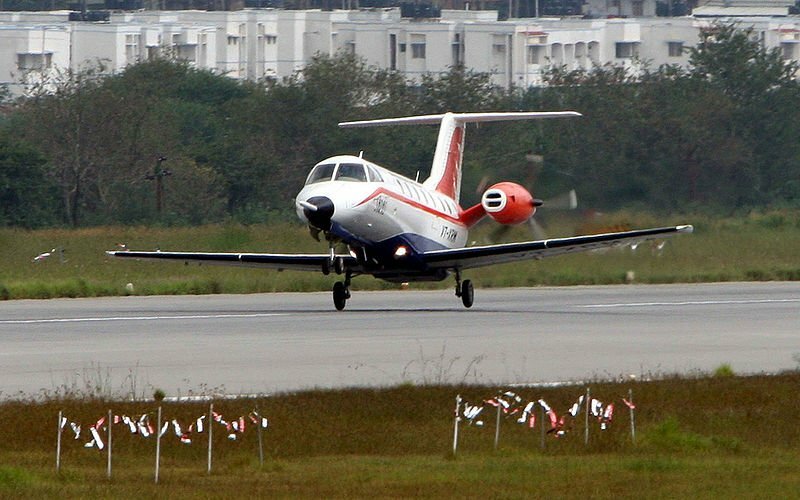 The Saras airplane was scheduled for carrying out test flight no 49 on March 6, 2009, which would include inflight engine shut down and relight procedure at 10000 feet AMSL. The aircraft took-off from Bangalore-Hindustan Airport (BLR) at 14:55. The flight was cleared to flight level 100. After completing general handling checks at 9000’AMSL without any events, a single engine simulated approach was carried out on runway 09. At about 15:11 the crew were cleared to perform an overshoot. The crew contacted the Bangalore Radar controller, who cleared them back to FL100 and proceed to sector Southwest 2 for carrying out the engine relight test procedure. The crew reported reaching 9000’AMSL in sector Southwest at about 15:18. The nr.1 engine was then shut down and secured following the test procedure at about 15:31. After about 47 seconds, the nr.1 engine relight procedure was initiated at around 9200’AMSL. After a successful left engine shut down and its securing procedure, at about 15:31 left engine relight procedure was initiated at about 9200’AMSL. The propeller blade pitch was selected from feathered to fine. This led to an increased in propeller rpm from 5 to 55%. Side slip increased up to 28 degrees and bank angle changed from 8 deg right to 70 degrees left. The pitch attitude was seen reaching -42 degrees. Propeller rpm continued to increase to 91%. Then the aircraft went into a sudden dive from 9200’ to 7300’ for about 13 secs. The aircraft was brought under control at this altitude. The crew continued their attempt to relight the engine but this was not successful. Meanwhile the side slip remained at 22 degrees with a pitch attitude of about -15 deg. The speed remained at 130 kt and altitude reduced from 7000 feet to 5200 feet. increased to as high as 90 kg with aileron forces raising to 40 kg. The crew were not able to fully control the airplane and arrest the descent. It impacted the ground. The aircraft was completely destroyed due impact and fire. Incorrect relight procedure devised by the designer and adopted by the crew at insufficient height leading to rapid loss of altitude and abnormal behavior of aircraft resulted into accident. c) Non-aborting of flight by the crew in coordination with the flight test Director after failure of first relight attempt. d) Devising engine relight procedures by NAL without consulting the propeller manufacturer.